Following pressure from the financial sector, Elbit Systems has confirmed its newly acquired subsidiary IMI Systems will be discontinuing its activities related to cluster munitions. Elbit Systems has also stated to PAX that all Elbit Systems munitions activities will be in accordance with the Convention on Cluster Munitions. Following launch of the Worldwide Investments in Cluster Munitions report in 2018, which identified Elbit Systems as being connected to the production of cluster munitions, Elbit Systems’ confirmed with PAX this week that IMI Systems will be discontinuing its activities related to cluster munitions, as was first reported in Israeli media early January. In a written exchange with PAX, he also added that “all munitions activities by Elbit Systems, including those of IMI Systems, [will take place] in accordance with applicable international conventions or US law [including] the Convention on Cluster Munitions. PAX welcomes the announcements by Elbit Systems and especially its recognition of the CCM, the Convention that was put in place especially to protect citizens from the incomprehensible harm caused by cluster munitions. We will carefully monitor the company to check that it does indeed implement the decision to stop production and comply with its statements and the prohibitions lead out in the CCM. We will also look for further information regarding the status of specific products previously produced or marketed by IMI Systems. 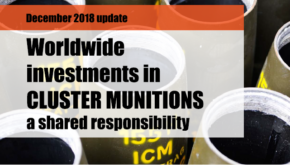 The events since December 2018 also show how deeply embedded the norm against cluster munitions has become in the global financial sector. The decisions to divest from Elbit Systems by HSBC and others in the financial sector came very quickly after the completion of the acquisition. The move by Elbit Systems shows that the commercial defense industry understands that cluster munitions can no longer have a place in modern military arsenals, even in countries where the government so far refuses to accept the international norm against these weapons. The financial sector has long been aware of the cluster munition activities by the previously state-owned IMI Systems, and diligently turned this knowledge into action. 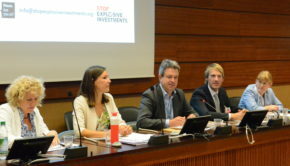 Michel Uiterwaal, project leader on weapons and the financial sector at PAX and author of the Worldwide Investments in Cluster Munitions report, said: “The Convention on Cluster Munitions was adopted to protect citizens from the incomprehensible harm caused by cluster munitions. Elbit Systems’ recognition of this international norm is an important step and shows the role the private sector has to play in the protection of civilians during conflict”. 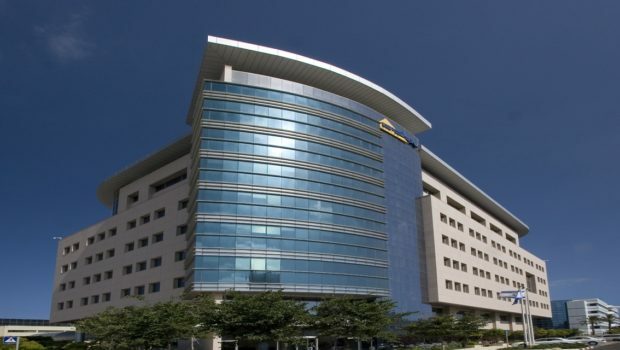 Elbit Systems’ decision follows in a series of similar announcements by commercial producers from other countries that so far remain outside the CCM. Most recently, US arms producers Textron and Orbital ATK (now part of Northrop Grumman) made similar decisions to discontinue production. This development also shows the important role the financial sector has to play in encouraging the defense sector to recognize the impact of their products, especially those prohibited by the international community. After the announcement late 2018 that Elbit Systems’ acquisition of IMI Systems was completed, major financial institutions including HSBC announced they would withdraw their investments from Elbit Systems, because of its new subsidiary’s cluster munition activities. This prompted Elbit Systems to publicly declare the cluster munitions activities of IMI Systems would be discontinued.